Get a quick and easy overview of all the daily quests you care about, across all your characters. 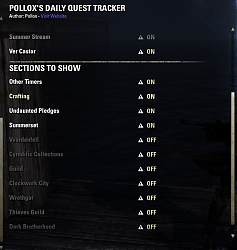 Tracks which daily quests you've completed today, and which ones you're still eligible for. 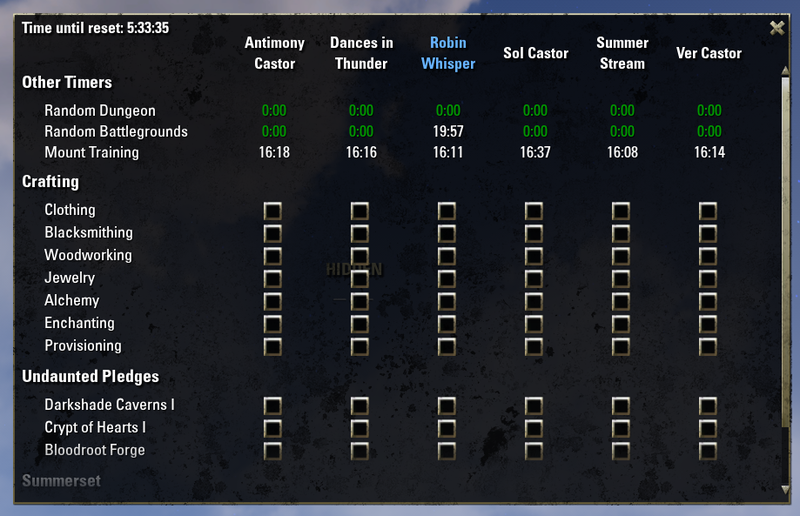 Also gives you a timer to show when quests reset. Find out what today's pledges are. See which alts still need to do crafting. Or which Summerset World Boss quests you're still eligible to have shared. Or just to be a daily completionist. To use, first set a keybinding to show/hide the window under the Controls menu. 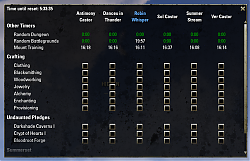 If you have multiple characters, I recommend Votan's Keybinder addon to set the keybinding once for all your characters. You can also toggle the window by using the command /dqt in chat. 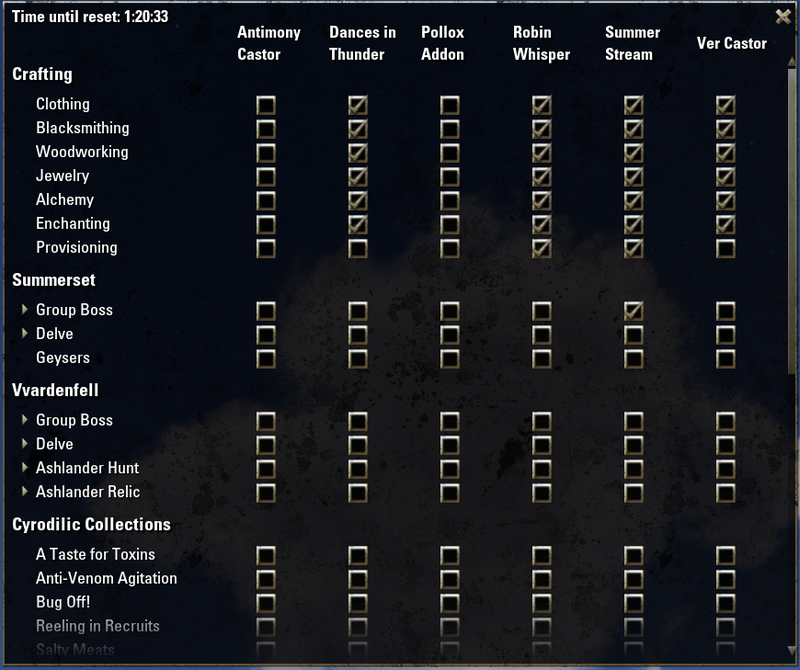 Then in your addon settings, turn on the quests you want to track. Note: not compatible with the addon "Daily Quest Tracker". Please disable or uninstall that before enabling this one. It can create a large file in your saved variables folder, which can crash your game. 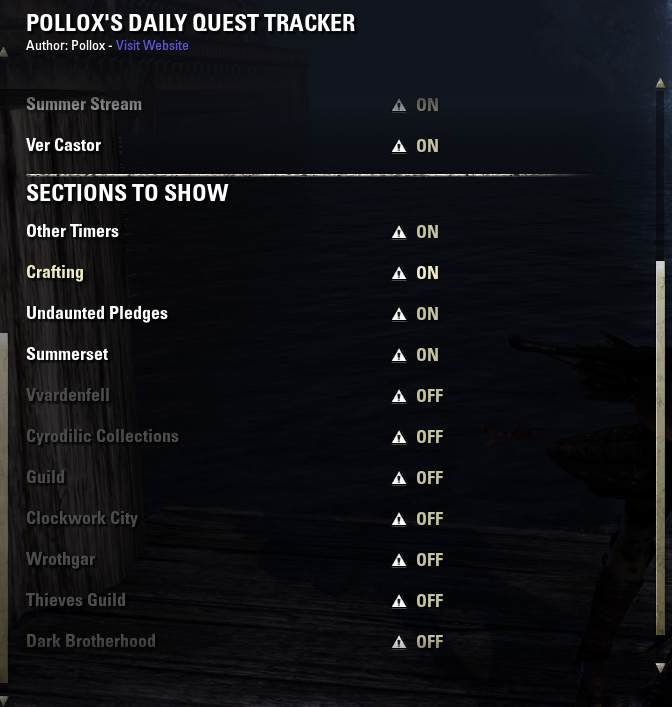 It will only track quests you picked up after you installed the addon. The addon currently does not distinguish between a quest you picked up, and one that someone shared with you. You must exit battlegrounds before it will record it. Don't log off directly from the battlegrounds. If you pick up a quest one day, but don't turn it in until the next day, the app will assume you are eligible to do your daily quest still. This is usually true, but in some cases you might get assigned the same daily quest that next day (e.g. same world boss), in which case the game actually won't give you a new daily quest. I've been using this for keeping track of all the delve and world boss quests for the second week of the anniversary event. It does a great job. Thanks for your work on this, Pollox. There's only one thing I've noticed that I wanted to mention. It tracks quest completion based on when you took the quest, not when you turned it in. 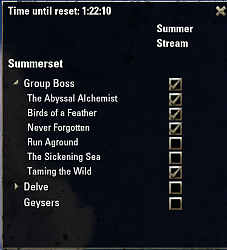 For example, if I had a world boss or delve I picked up yesterday, and I complete it today, the add-on doesn't mark that as completed for today. The game obviously does consider it completed since I won't be able to get that quest again today. I'm just pointing this out for anyone reading this that might be confused. I'm not requesting a "fix," since it probably involves a fundamental way the add-on is coded. It's just something to be aware of. Glad to hear this addon is working for you now. The check to see when you picked up the quest is actually a feature. When you turn in a quest one day that you picked up the previous day, you're eligible to pick up another quest, so long as it doesn't happen to be the exact same one. There's no way to check if it will be the same one (only the game knows internally), but most quests are on a cycle where they won't give you the same one two days in a row. For example, for crafting, you don't want it to show daily writs complete if you picked them up the previous day. Where it gets funky and has caused issues for me is usually is with shared quests. 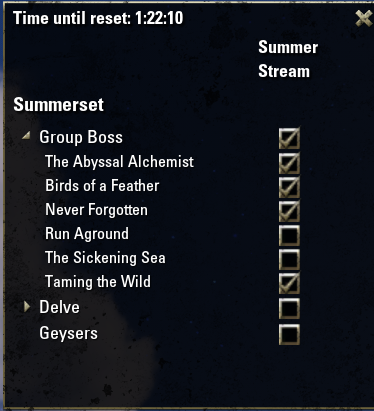 For example, let's say you pick up Graveld world boss quest in Summerset one day and turn it in the next. You're probably still eligible to pick up another world boss quest, unless it's Graveld again. But, no one can share Graveld with you even though it's not checked off. Sure, I could have different icons for completed, completed but picked up a different day, and not completed, but I think that would be hard to decipher in this simple display, and ultimately not very useful. This add-on seems like absolutely what I've been looking for. However, I installed it a couple days ago, and not long after installation, ESO started consistently crashing. I even got a popup window every time to submit a report of the crash to ZOS, and I've never gotten that before. I was able to keybind it and change some settings before this started happening, but once it started, the game would usually crash within a minute or two of logging into my character whether I touched the add-on or not. I uninstalled the add-on, told it to delete any saved variables, uninstalled LibAddOnMenu, and reinstalled LibAddOnMenu, while doing complete shutdowns and restarts of the game after each step. The game hasn't crashed since. So, it was indeed this add-on. I notice that this hasn't been updated since the Wrathstone/Update 21 hit earlier this week, so that was the obvious thing that came to mind first. Still, I've never had outdated add-ons actually crash the game before even if they just didn't work. I'd love to use this add-on, so if there's anything I do to help, just let me know. I'd be willing to install it again and send copies of the crash report text that gets sent to ZOS if that would help. Just let me know. Hmm, the only case I heard of this crashing was with a conflict with another addon (Daily Quest Tracker) which caused the saved variables file to get too large. You could check that file and see if it's getting really big? I haven't had much time to work on this addon lately, or checked the comments, so sorry for the delayed the response. The only reason I haven't bumped the version to Wrathstone is because the order for the dlc dungeons is outdated. Other than that, it should work and I haven't seen any issues using it daily. I'm happy to take a look at the crash report text if you can reproduce it still with the latest eso patch. There might be useful info in there, or it might be all gibberish that only ZOS has the tools to read. Thanks for the detailed reply, and sorry to hear it gave you trouble. Pollox, it's working for me now. I reinstalled it for the second week of the anniversary event to track all my delves and world bosses, and it's been doing a bang up job of it. Now, the experience I described above was still my actual observations at the time. However, it seems there's a good chance that the recent update when I wrote that played some major role in it. Wrothgar quest tracking bugged, for example king chief edu or ogre. I can probably do that one because it works the same as the others. 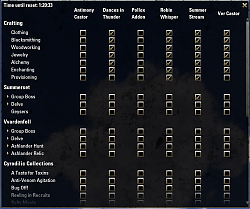 Just need to wait for UESP to update with the list of quest names. Would it be possible to get the DB: Shadowy Supplier added? It's a 20hr timer. Interesting, I didn't know about that one. It's not a quest, but I think I should be able to implement it without much difficulty. I'll add it to my list. can you add to the list events repeatable quests too? I haven't found time to add any new features lately, but I don't think I will ever add event quests. They can change from year to year, and I don't update enough to keep up with them. Last edited by Marazota : 03/29/19 at 11:37 AM. Absolutely amazing addon, thanks Pollox! Re: Gayser is not work? Even if Gaiser clears it will not be checked. Is this because you do not organize a group? It doesn't require a group. Could be a translation issue. Compare journal name to name in jp_quests. Also, you can try uninstall (including saved variables) and reinstall. If you'd like to give money as thanks, please consider donating to my favorite charity, Doctors Without Borders. Feel free to send me a message or leave a comment letting me know you did, and you'll have my gratitude. If you'd like to send me something in-game, I'm @Polloxer on PC/NA. Gold, crown gifts, or messages are all appreciated.